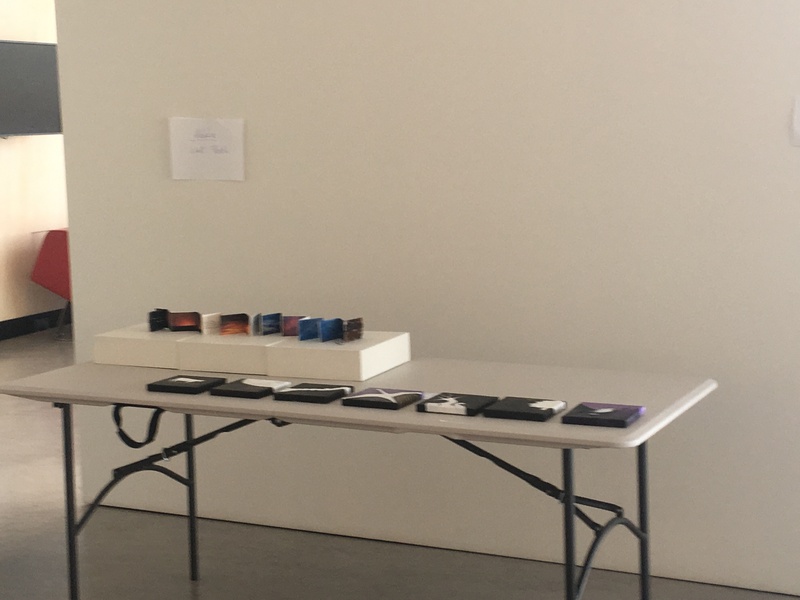 One of the dreams of my life has been to assist in hanging an art exhibition, and that dream was realised this last week at Belconnen Art Centre in Canberra, with the exhibition Postcards from the Sky. I have two pieces in it. As a writer and image maker, I am often working away creating, selecting and arranging words and images, but I have never exhibited visual work in this traditional context and never expected to. I worked in Film Preservation for ten years at the National Film and Sound Archive, with physical film, mainly pre-1951, so I have a love and affinity for handling precious objects (and also honour their strength, fragility and physical qualities). I also get off on counting things, checking things, placing things, naming and numbering things, and caring for objects. I have been fascinated by collections since childhood. (What makes a collection, what is left in and what is left out?) I loved natural museums as a child. 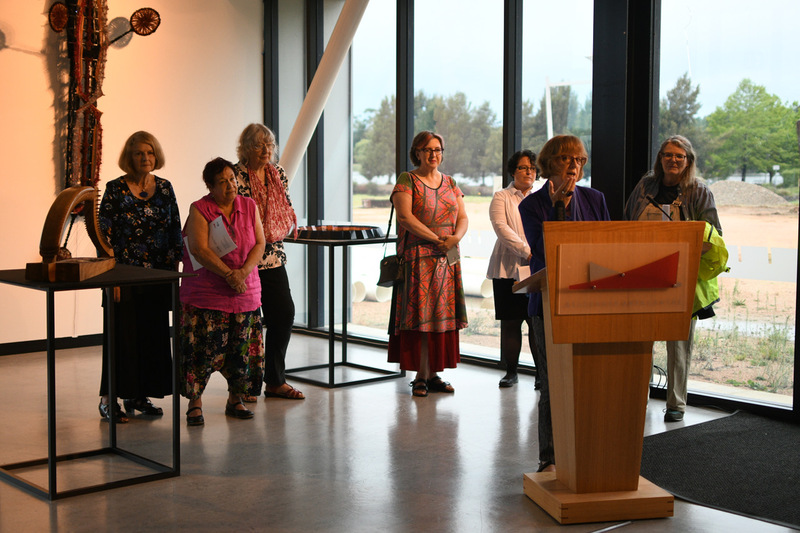 And as an adult an art exhibition is great fun, is often moving, surprising, and an exhibition opening is a wonderful celebration. An art exhibition is a sort of collection to me, a special place and time that has been curated. I often say I grew up in a house that was like a museum, my mother the curator of objects collected by relatives who may have been borderline hoarders. She inherited the treasures of a father-in-law who died in the Spanish Flu pandemic just after World War 1, who had brought back from his time in Egypt, Gallipoli and France, hundreds of objects. (Our door stoppers were shell casings, and we had cannon balls in the garage.) Some objects ended up in the Australian War Memorial, ( a collection of signs from the trenches and weapons and more) and recently the Nicholson Museum at the University of Sydney accepted a collection of Egyptian artefacts that we stored in a cabinet on top of a cupboard. It wasn’t opened for a hundred years. As children we were warned off it, though on occasion I climbed up and tried to peer into the darkness of the coffin-like cabinet. I could just see tiny amulets and statues. We were told there was a cat mummy in there. Poor Mum, we discovered also that her mother-in-law lived near a clearing house and her favourite pastime was to peruse the catalogues and warehouses for ‘finds,’ and Mum had those things to care for as well. So from such origins my relationship with things, with objects and collections developed, and the dream of helping hang an art exhibition arose. Now, I can’t claim too much. I held measuring tape. I stood with my arms above my head holding unframed paper against a wall, I sorted and handed pins, I held hammers. 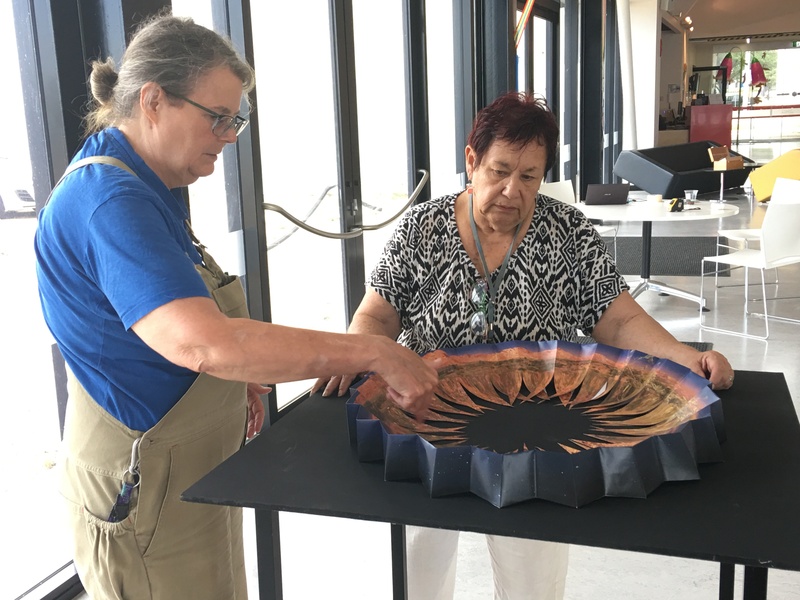 Lizz Murphy (powerhouse facilitator behind the living studio and exhibition that developed so quickly from it) and I thinking we knew what we were doing, measured up my piece As Above, So Below 1 – Where Are You? got it skewiff and I marked the wall. There we were with gumption scrubbing the wall, our hands way over our heads, a wee bit ageing, me at least feeling my aches. 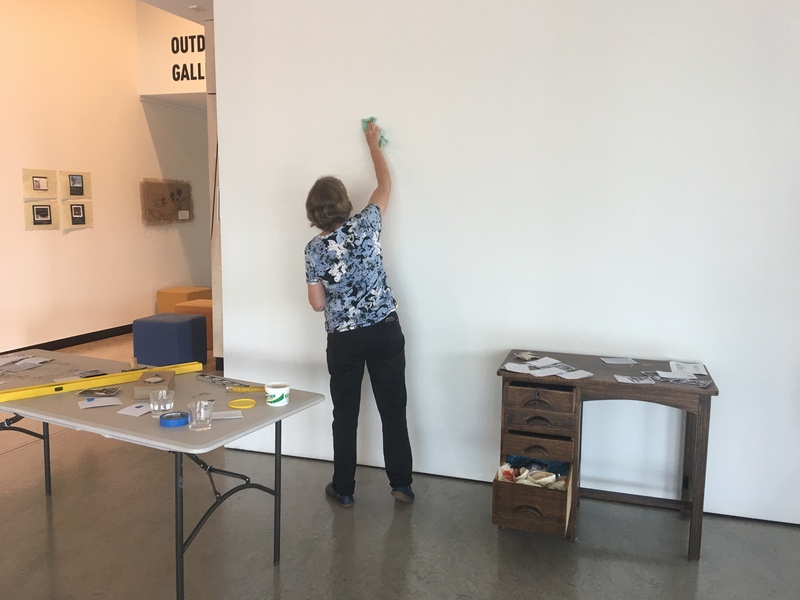 Ann McMahon let us have our way, then glided in after we cleaned up our mess, and kindly showed us how it worked. I love to learn. 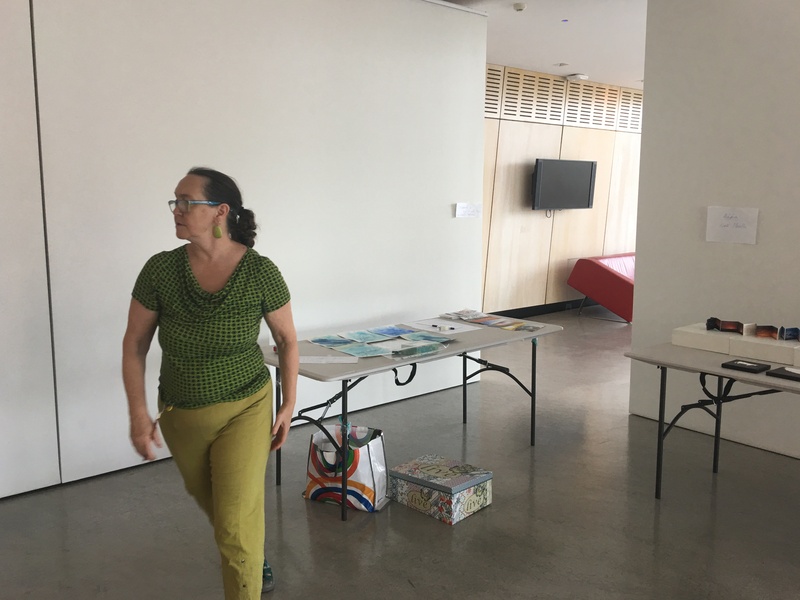 It was a group effort of the artists in the exhibition, but the main people hanging the show were of course the staff of Belconnen Arts Centre, especially Ann McMahon, Dianne Libbke, Damien Hicks, and Skye Rutherford, overseen by co-CEO and Artistic Director Monika McInerney. 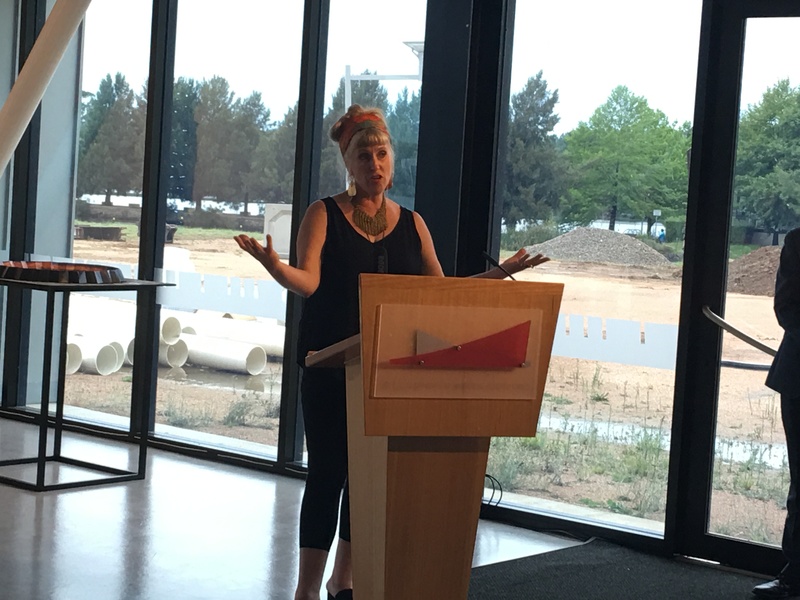 We were overwhelmed at the generosity of being given the whole foyer for a start, the glorious space by Lake Ginninderra, with the views and light, and the interest of the construction site next door beginning the extension. 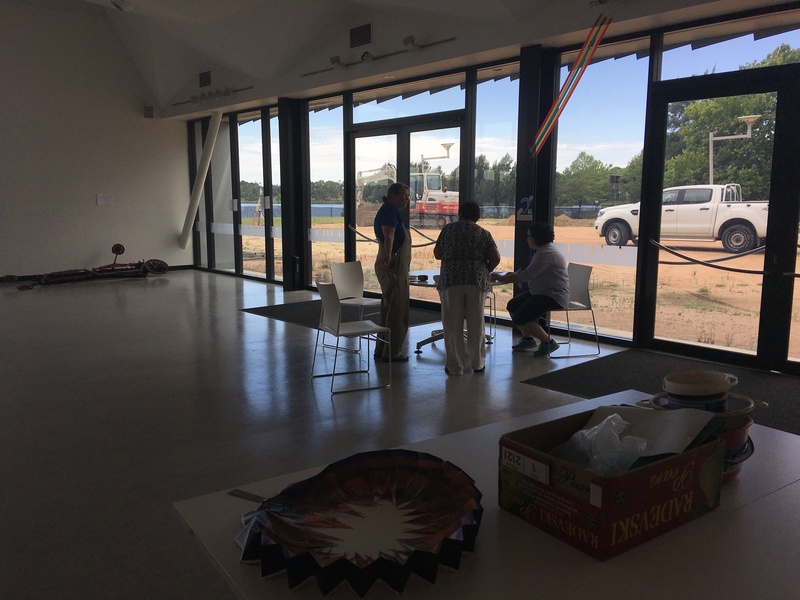 To experience the space transforming into an exhibition was a gift. 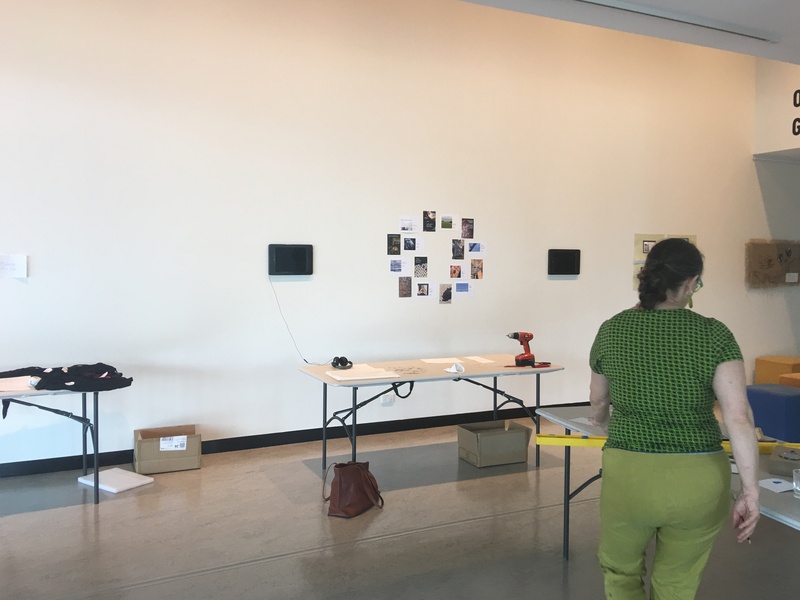 Akka Constantin Bellinger and I unpacked the art that arrived during the first days and laid them out on tables. I observed Jenni Kemarre Martiniello’s keen visual and storytelling sense as she devised the layout of the exhibition, the eyelines, how pieces might talk to each other, and Ann, Damien, and Skye brought their own aesthetics and knowledge to the process, and also how to interpret Monika’s vision. ‘Clean eyelines are important.’ ‘Monika likes grids.’ But there was no rigidity, ideas were tested. We were all honoured and our work treated as precious expressions. I love the physical cooperation of doing a task with another person or people. It is unusual to stand so close to a stranger arms above your head on tip toe in the summer heat, for me, usually a keyboard sort of worker these days. I love taking the physical instruction of another, ‘hold your hand this way then slide it down, I will do this, then you do that.’ The process. Lizz related Ann’s knowledge of knots and her clear instructions (a skill begun with fishing with her father), to hang mobiles. I love knots myself, from Girl Guide days, making gadgets out of sticks, instructed by my mother. And there is conversation. Wonderful conversation about art, family, observations, work, and laughter. Also there is cleaning (cleaning is life is it not?) Kindness. Politeness. Care. Even emotion in all our body’s heat and fatigue. Everyone turning up. And turning up. As they could. Helping each other. 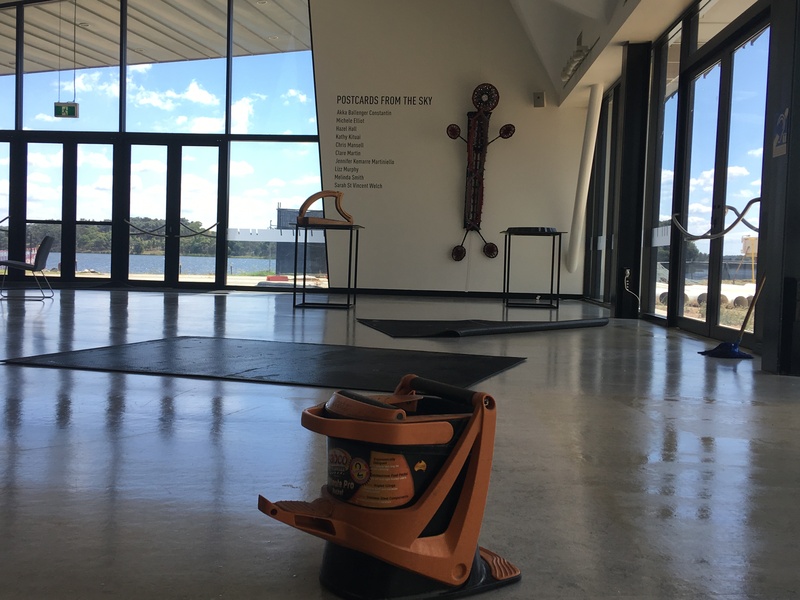 Postcards from the Sky Belconnen Arts Centre Foyer February 8-March 17 2019. Exhibition of words and images (new work and works in progress) by 10 artists and poets with an ongoing living studio. I will be writing more soon about the experience of the Living Studio that developed this exhibition. Such a beautiful story and documentation of our experience Sarah. Thank you Lizz I am pleased I got it right. 🙂 So much to learn! This is lovely, thank you Sarah. Just speak with Di of fabulous Front of House Coodinator about volunteering with us at the centre. There is a wee process but all very straight forward and you would be most welcomed. Curious about the eyelines and conversations between artworks. What was said? Did it change? 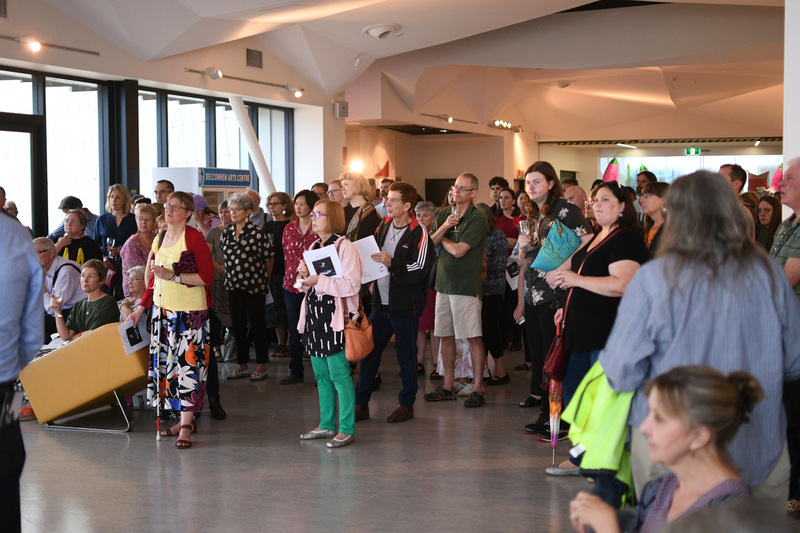 And the generous community of makers that carried through the idea into a celebration and show.